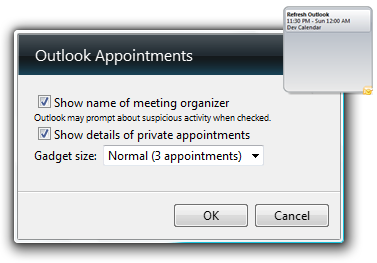 For this Sunday’s Office tip we are going to look at Vista Sidebar Gadgets that can help you better manage appointments and GTD lists in Outlook 2007. When Vista first came out I was not a fan of the Sidebar or its gadgets. At the time, gadgets seemed only to be resource consuming “”eye-candy”. As this technology has progressed I am finding more useful Gadget applications. The first one to check out is Outlook Tasks. 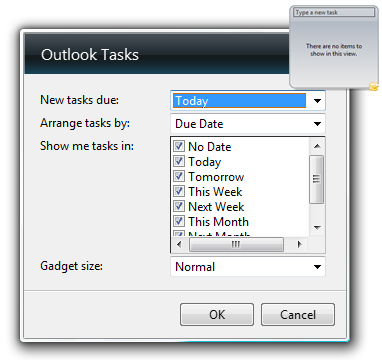 This handy application will show your tasks scheduled in the To-Do Bar in Outlook 2007. Not only will the tasks already scheduled in Outlook display, but you can also add new tasks by typing them into the Gadget. This will update the To-Do list in Outlook as well. As you finish tasks just check them off the list in the Gadget. We can choose how tasks are displayed in the gadget in Settings. Arrange by Date, Importance, or Category. You can also choose the size of the gadget. The other gadget we can look at is Outlook Upcoming Appointments. This one allows you to see upcoming appointments from your Outlook Calendar. You can make a few changes by choosing the number of appointments that show, the maximum number is five. Here is a shot of both of these gadgets showing in the Sidebar. 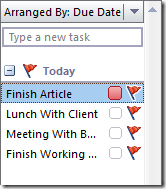 Personally I enjoy Outlook Tasks the best. It really helps during hectic days when the GTD list is overwhelming. I am curious to know if any of you have found useful Vista gadget. Please comment and let us know!